Who is excited about the US total solar eclipse that will happen on Monday? For those of you who aren’t able to travel to that narrow strip path the cuts diagonally across the US, I have a way for you to experience a special eclipse at home. This is an Eclipse Burger with a Totality Bun, Sunny Chickpea Patty and Corona Sauce. 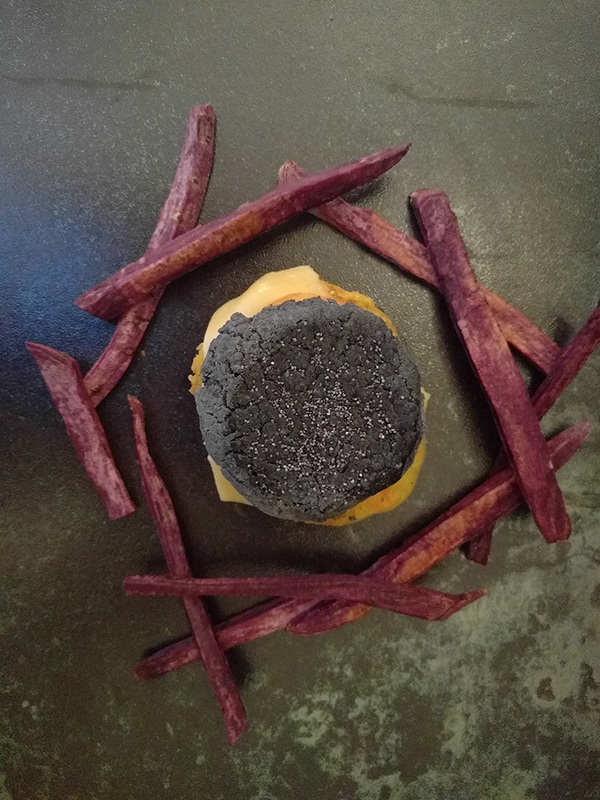 The burger is surrounded with Purple Galaxy Sweet Potato Fries! I had been planning on making an eclipse burger after I learned about the 2017 eclipse this past Spring. I saw a gluten-free charcoal bun in a Japanese vegetarian magazine called veggy. I translated the recipe using my mad Katakana reading skills and with the help of Google Translate! I changed some of the components and converted all of the metric units to standard ones, thanks to my handy kitchen scale. 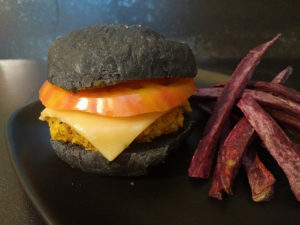 The gluten-free charcoal bun is little more like a black English muffin. The texture was surprisingly chewy and not crumbly and dry like other gluten-free items I’ve tried and it held up quite well with the other ingredients. 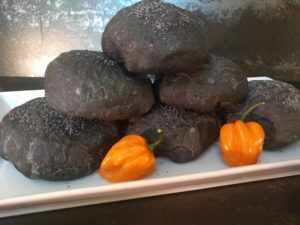 I also made my regular wheat bun recipe but added activated charcoal to make it black. Here are the recipes to the 2 different TOTALITY BUNS! Put lukewarm water in a glass measuring cup and the sugar and yeast. Stir to mix and leave for 5 – 10 minutes. Place all dry ingredients in a mixing bowl and sift together. Add contents of measuring cup and oil to the dry ingredient bowl and mix with a spatula until a ball forms. Cover the bowl and place in a warm place for at least 30 minutes to rise. Divide the dough into 4 pieces, make in to flat, circular shapes. Place on an oiled,large ceramic non-stick skillet or a well-oiled cast iron skillet. Sprinkle poppy seeds on top and let rise for another hour. Heat skillet to medium high and cook for 2-3 minutes on medium, them switch to low for another 10 minutes. Flip with a spatula, and cook the other side for another 10 minutes on low. Then bun is done with the sides are no longer sticky or have any moisture. The bun should feel firm. 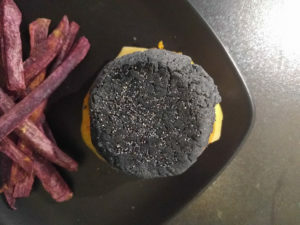 You would think that this bun would have a weird flavor on account of the charcoal, but it actually tastes great and can be just as fluffy as a white bun. Using a stand mixer, put on the kneading hook, and add the water, yeast, and sugar to the mixer bowl and wait 5-10 minutes. In a liquid measuring cup, mix together the milk, flax, and oil and then add to the yeast liquid in the mixer bowl. In a metal bowl, sift together the flour, salt, and charcoal powder. Slowly add the flour mixture to the liquid in the mixer bowl and mix on low speed. Knead for about 10 minutes and then cover the dough and let rise for about 1 hour in a warm area. Place a silicon mat on a baking pan or oil a baking pan for the buns to bake on. Divide the dough into 8 pieces and pull the dough under each piece to make a round ball. Place each ball of the baking pan, cover, and let rise for 30-45 minutes.10 minutes before the rise is done, begin preheating your oven to 375 degrees. Brush melted vegan butter on the tops and sprinkle with poppy seeds. Bake for 15-20 minutes. You will not be able to tell if they are browning because they will be black! Let the buns cool and then slice them in half and serve with your favorite patty.For an Eclipse burger, use the Sunny Chickpea Patty. I wanted the patty to be a bright yellow color. The ingredients I chose were either naturally tan or yellow and combined created a bright flavor. Combined with a mottled red and yellow tomato, a super hot homemade Corona sauce (see recipe below), and a slice of Parmela’s Pepper Jack Cheese, you can imagine the fiery sun beneath the black shadow of the Totality Bun. Here is the recipe for the Sunny Chickpea Patty! This bright yellow patty will really shine with its sunny flavors. Place parchment paper on a large baking pan and add the cauliflower, olive oil and salt. Mix cauliflower until well coated with oil.Bake for at least 20 minutes or until the cauliflower has browned on edges. Add the cauliflower and remaining ingredients to the bowl of the food processor and process until it is well mixed and there are no longer whole chickpeas. Form the mixture into patties that fit your hamburger buns. Cook the patties in a large cast iron or non-stick skillet with a little olive oil on medium heat, about 5 minutes on each side. Serve on a bun of your choice, but a Totality Bun would be even better! These patties can be made ahead of time and stored in the fridge for 3-4 days. Here is the recipe for Corona Sauce! 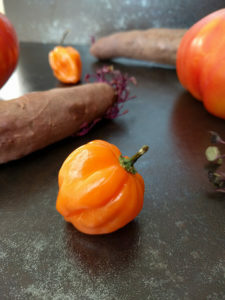 Get ready for some heat from habanero. No eclipse glasses can shield you from it’s power! Cut carrots in to 1/2 inch coins and them steam for 8-10 minutes until they are fork tender. Saute the chopped onion in a little water until cooked but not brown. Add the carrots, onions, and all the other ingredients to a blender and blend on high until smooth. Add more water if needed, 1 TBSP at a time.If it is too hot for your liking, reduce the habanero or add more carrots! Let me know if you try making this burger! I suggest making the patties the day before and making the buns in the morning. Enjoy the US Total Eclipse wherever you are. If you feel like you missed out, the total eclipse to hit the US will be in 2024 and will pass through Texas. Start planning and have this out-of-this-world burger in the meantime!